The Atlanta Public School Budget Commission, chaired by Matt Westmoreland, convened yesterday to consider how to fund additional educational priorities that remained unfunded under the original revenue projection of $668.8 million. The Commission decided to include up to $14 million owed by the Beltline in its revenue projections for FY16 which raises the total revenue to $682.8 million. The $14 million Beltline payment that has accumulated over the last two years remains unpaid and is the subject of a dispute between APS and the City of Atlanta. The Beltline currently does not have the funds to make the payment and the City of Atlanta – led by Mayor Reed who is the chief negotiator – is a party to the original contract and is liable for the amount due to APS. For more background on the dispute, see the AJC article here. The Commission is taking the position that the amount is due to APS and that the revenue should be included in the FY16 budget. However, the Commission has also determined that in the event the payment is not received, the General Fund reserves of $14 million will be used to cover the additional expenditures added to the FY16 Preliminary Budget. In addition, the Budget Commission determined that if the Beltline payment is received, the total expenditures will increase to $696.8 million and the $14 million in General Fund reserves will be used to balance the budget. The administration anticipates that the General Fund reserves at the end of FY15 will be $61-66 million and the use of the $14 million in reserves will bring the balance down to the minimum threshold set by APS policy of approximately $50 million in reserves. However, even with the incremental funding source, additional priorities – including the pay parity issue (see here) – remain unfunded. The Board is considering adopting a plan to restructure the Pension Liability and, if a restructuring plan is adopted and subsequently approved in a voter referendum, the restructuring could increase available cash flows by approximately $20 million in the first year and $10 in the second year – and the amount would increase over time. In the event this occurs, then the funding structure for the FY16 budget will be revised. 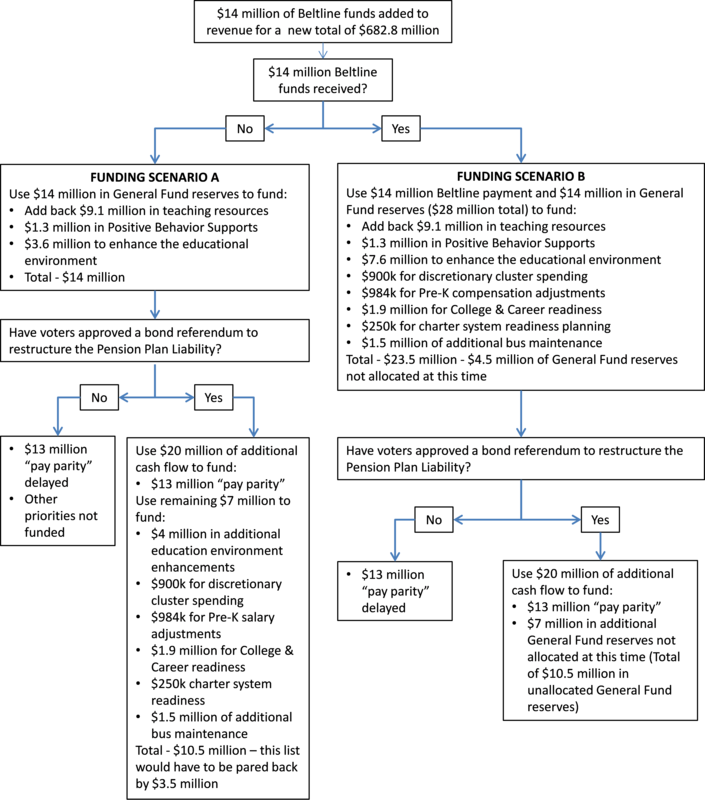 The alternatives presented above have multiple dependencies on the different payment streams and the following flowchart attempts to lay out the complex decisions and incremental expenditure funding under each scenario (click to enlarge). Based on the expenditure proposals under each scenario, it is clear that Board and the Administration are placing the funding of educational priorities first. Next in-line for funding are pay raises for teacher and other personnel, but they are dependent on receiving the Beltline monies and restructuring the pension liability. Also, based on the $7.7 million in cuts announced in administrative expenditures, Superintendent Carstarphen is taking steps to “right size” these functions and reallocate the cost to other educational funding priorities. Additionally, the Board appeared unwilling to adjust the property tax millage rate and, at this time, tax rates will stay at the same level as this past year. The Administration will incorporate the changes that have been agreed upon and present the revised FY16 Preliminary Budget at a public hearing that will be held on Monday, March 2 at 12 p.m. prior to the regular Board of Education meeting that will begin at 2 p.m. The Budget Commission has made substantial progress and, due to the critical nature of the discussions, all nine Board members were in attendance for part or the entire Commission meeting. My sense is that a conclusion will me reached in the very near future. This entry was posted on Thursday, February 26th, 2015 at 10:53 AM and is filed under Uncategorized. You can follow any responses to this entry through the RSS 2.0 feed. You can leave a response, or trackback from your own site.